Scale aerobatics consists of highly skilled RC pilots competing in world-wide events where the objective is to use their scale model airplanes to mimic their full-scale counterparts as they perfect each maneuver. In 1974 a group of about 100 RC pilots got together and thought it would be pretty cool to imitate IAC aerobatic competitions with their RC airplanes. Since most IAC planes at the time were bi-planes, this group called themselves the National Sport Biplane Association. The IAC thought this was a great idea, so they embraced the group and the name changed to IMAC! IMAC stands for International Miniature Aerobatic Club. It is a special interest group of the AMA. By replicating full-scale aerobatics with radio controlled airplanes, IMAC truly is a miniature version of the International Aerobatic Club (IAC). It is sometimes called the "Mini-IAC". There are five levels or "classes" of competition based upon each pilot's experience and skill level. The freestyle is an optional event that takes place after the other classes have finished competing. The freestyle event is where RC pilots show off their mind-blowing 3D routines! The competitions consist of sets of known maneuvers to perform in a specific order This is called a sequence. IMAC competitions usually also require that the pilot fly an unknown sequence that is given to the pilot the day of the contest. The difficulty of each maneuver of a sequence is given a K-Factor. The judges' score of each maneuver is multiplied by the K-Factor to obtain the final score. Perfecting more difficult maneuvers will land you higher scores. The maneuvers become more challenging as you move from up through the classes. In order to be eligible to participate in IMAC Scale Aerobatic competitions, your aircraft must resemble a full scale aircraft capable of competing in an IAC contest. The rules state that the aircraft will be judged for "likeness" at a distance of approximately 10 feet. The wingspan of the airplane determines the "scale" it is. The fuselage width and height can't deviate more than 10% from being perfectly scale. The rules also state that a realistic human pilot figure and a viewable instrument panel must be installed in the cockpit. The engine of the aircraft can not be louder than 96dBA. Although IMAC's primary goal is to replicate full scale aerobatics, there are some distinct differences between models and real airplanes that must be taken into account. 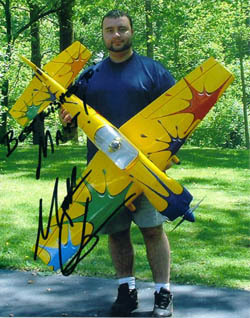 The perspective of the pilot is obviously the biggest difference between flying an RC plane and flying a real airplane. Since an RC pilot is stationary, it is easy to see when the airplane begins to drift off course due to the wind. For this reason, all of IMAC's maneuvers must be corrected for wind drift. In other words, when flying in an IMAC contest your airplane must fly parallel to the flight box regardless of how hard the wind is blowing. Since our radio controlled planes are much lighter than full-scale planes, the wind knocks them around a bit more. To compensate for this, IMAC judges deduct one point for every 10 degree deviation from a perfect maneuver where as the IAC deducts one point for ever 5 degrees. RC planes aren't burdened by the physical limitations of a human pilot. This allows IMAC's higher class sequences to be a bit more aggressive with higher G maneuvers than what is typically seen with real full-scale competitions. I had the honor of listening to Matt Chapman speak at the 2009 Toledo Show. He told an interesting story about his first IMAC contest. He described how other beginners were complaining that it just wasn't fair that a highly skilled full-scale aerobatic pilot like him was allowed to compete in the Basic Class. He found it quite amusing that those same pilots later apologized to him after watching his terrible performance! This proves that being one of the all time best full-scale aerobatic pilots of all time doesn't really help you much when it comes to flying RC! I couldn't resist, I have to show you the picture of my Cap 580 ARF that Matt Chapman so graciously signed for me at the Willow Grove Airshow a few years ago in PA.
By the way, Matt is a super nice guy! Although IMAC is a special interest group of the United States' AMA, it is an international organization as RC pilots compete in competitions countries throughout the entire world. Here are just a few of the organizations across the globe that recognize and compete in IMAC competitions. How to Prepare for IMAC? You don't need a million dollar plane or top dollar equipment to competing in an IMAC contest. The best way to get started is to dive in head first! 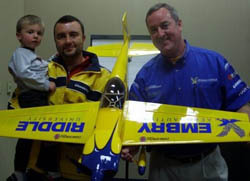 Download, print and study the AMA Rules for Radio Control Scale Aerobatics. Take your favorite sport model to the field and go at it! Practice, practice, and practice some more. When you think you are ready to compete, use the links above to find out where to sign up!